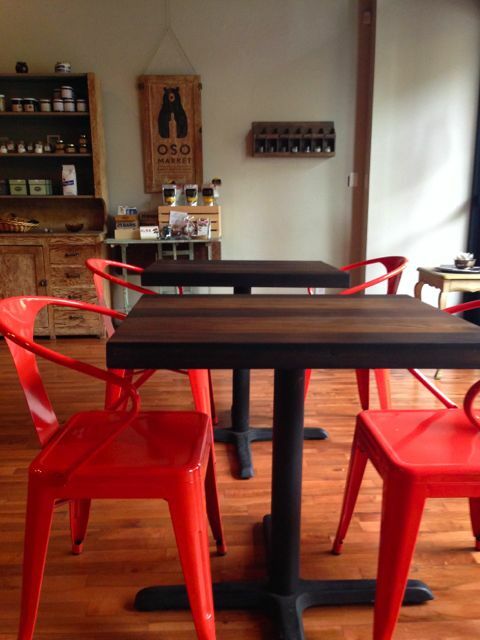 Oso Market is another new comer to the Portland food scene. This place is a perfect candidate for my Cheap Eats series because this is a great place, with delicious food at an affordable price. If you think Cheap Eats can only happen at restaurants where you order at the counter or food carts (which are both fabulous places by the way), think again. Oso Market will show you how it’s done. Another thing that really caught my attention and made me really take notice was when they did a fundraiser for those effected by the landslide in Oso, Washington. Even though there was no connection whatsoever, this restaurant saw a need and a common thread, be it a name, and jumped in to help. The day we wandered down was a Saturday afternoon around 1pm. I knew they had a brunch menu, but kind of assumed we had missed it. My husband was very excited when he realized that it was still being offered. We settle into a sunlight seat and start to check out the menu. 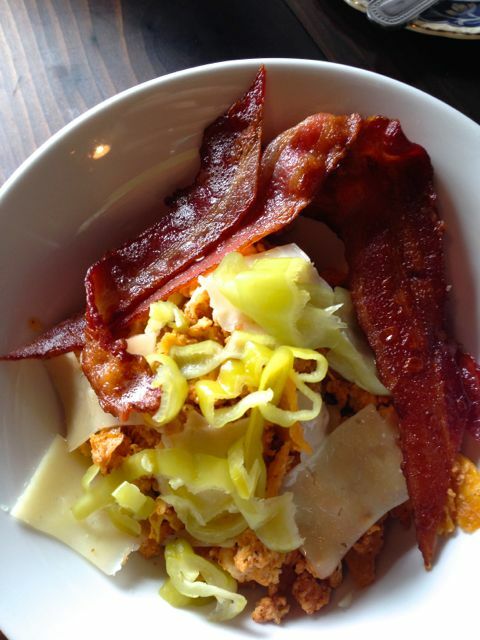 My husband chose the Chilaquiles ($7) from the breakfast menu. Even though I am leaning towards a breakfast item I choose the Kale Parmesan sandwich($9) because it had a fried egg on it. 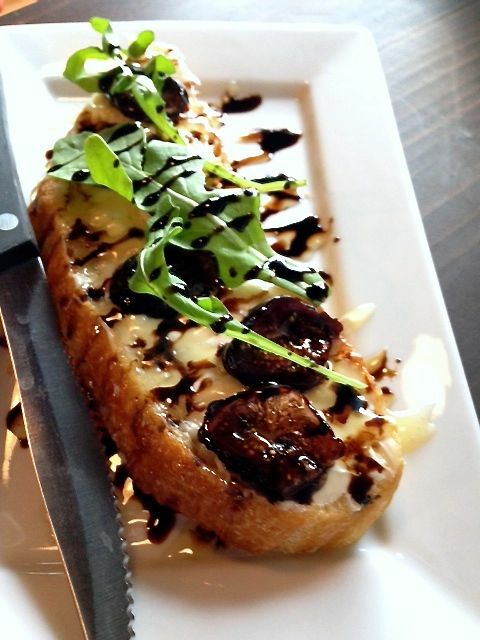 We were also told we needed to try the one open faced sandwich, with fig, honey and arugula ($6.50) so we did. I should also point out that this is also a wine bar and you can also purchase some cheeses from other countries. This intrigues me because I’m here because of my Cheap Eats series. The honey, fig, arugula sandwich came out first and it was fantastic. As you can see from the picture at the top it was a beautiful presentation too. Not quite big enough for a meal, but a great starter for sure. Then our entrees arrive. Great presentation. The Chilaquiles was really flavorful. My husband tends towards breakfast dishes with a Mexican flair, which this one had and he liked it. My sandwich was quite large. The bread it was served on was quite large too. I actually took the top off and ate it as an open face sandwich, mostly because I wasn’t sure how I was going to get my mouth around it. 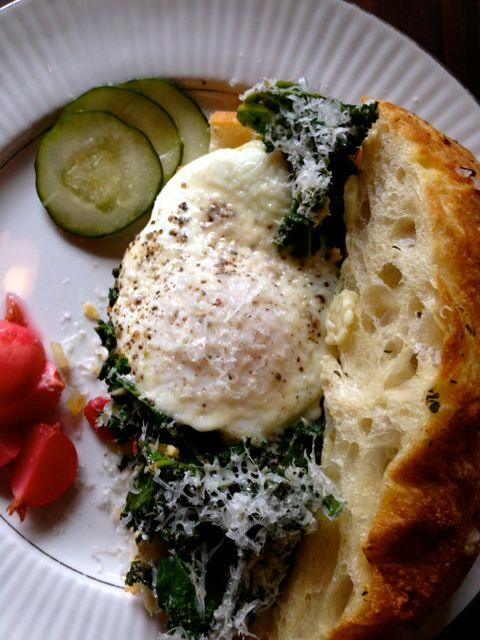 Kale and eggs, a great combo and the garlic aioli was the perfect compliment to this sandwich. I highly suggest this place. The menu has me wanting to come back for more and I really loved the space. I mostly love that you can get a really affordable meal in a great, great space for under $10. Way to go Oso Market, you nailed it! Atmosphere was so great. Deep dark wood, walls lined with wine, yet large windows that let the spring sun in. Pricing was great. The most expensive entree on the lunch menu was $12, yet there were many items below $10. Dinner menu also offered many items below $10. They obviously have wine here and a few beers on tap, plus tea and coffee for breakfast. 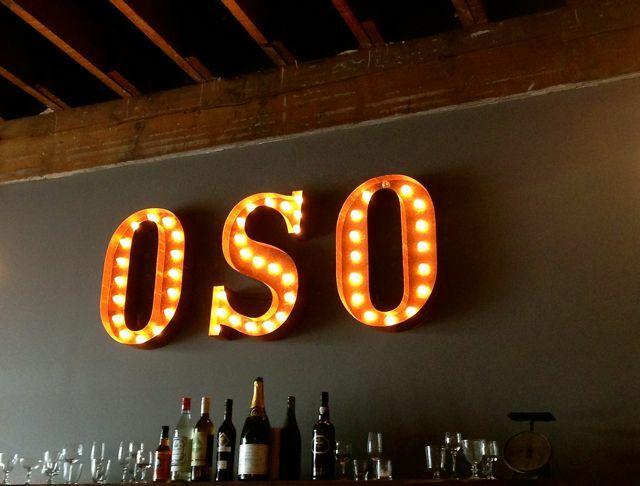 Oso Market + Bar is located in SE Portland on Grand St.
Click here for more Cheap Eat options.